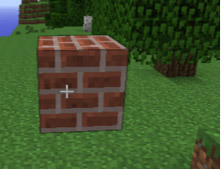 Modding Minecraft allows players to make large interactive modifications to their Minecraft worlds with a simple click of a button. Although you can build infinite mods, this book focuses on creating Minigames within Minecraft, where players can compete in single-player and multi-player mode. Designing and coding the Minigames requires coding, but with the help of LearnToMod, you can create your own Minigame to play with friends! To mod Minecraft, you have to write code. Luckily, the LearnToMod Software walks you through that! One of the first things that you should learn is how to make drones in Minecraft and use them to build structures. 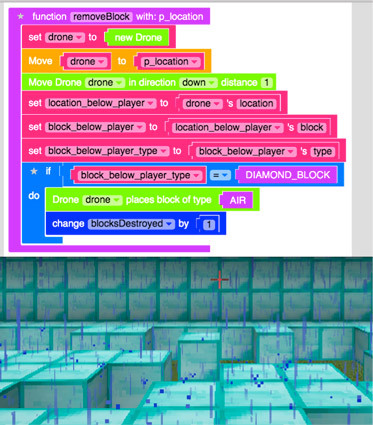 Drones are invisible robots that can move and place blocks of certain types, or even spawn entities (like Creepers)! 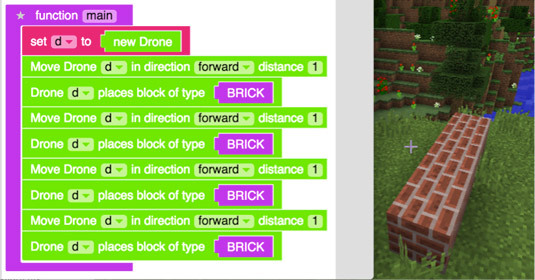 Creates a Drone and names it d.
Tells d to place a Brick block in Minecraft. The code you use tells your drone what to do. You can do cool stuff with your code. Make your drones do your bidding. Before writing all the code to make a Minecraft Minigame, you need to design your game. 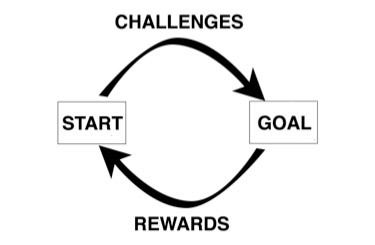 The Gameplay Loop is a simple process that you can follow to make sure your game is fun, challenging, and complete. Start: Create a basic scene. Goal: Add a way to win and lose. Challenges: Make winning more difficult. Rewards: Make your players want to win. Where kind of arena will you make for your player? Remember to think about what the player will see as a result of your code. Don’t forget code to make the blocks disappear. Players always appreciate a pat on the back. Don’t forget to test your Minecraft Minigame often and with friends!